' Has known the McCann family since three days after the disappearance (Sunday). That she went to Portugal on this date (06 May 2007), not to accompany the family but due to work related to the church, which was previously organized.
' That it is the truth that she only knows them through the church and never met them before.
' States that after getting to know the parents of the missing child, she invited Kate to take part in a meeting, in Lagos, on the 25th of May, with the intention of discussing items related to missing children. That she went to this meeting, with Kate and Kates cousin, Anne. They travelled to this meeting in the deponents car.
' 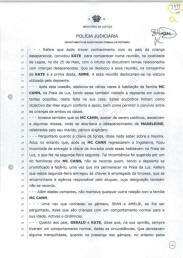 After this occasion, she went various times to the McCann residence in Praia da Luz, and they also visited the deponent, in her home, on various occasions. These encounters had the objective of offering them comfort and support but also allowed for the children of both couples to play.
' She also adds that the McCann's' although being Catholics, attended some masses, where Madeleines disappearance was noted, celebrated by her husband, the Anglican priest.
' Questioned regarding the key to the church, she says that she knows nothing of this. 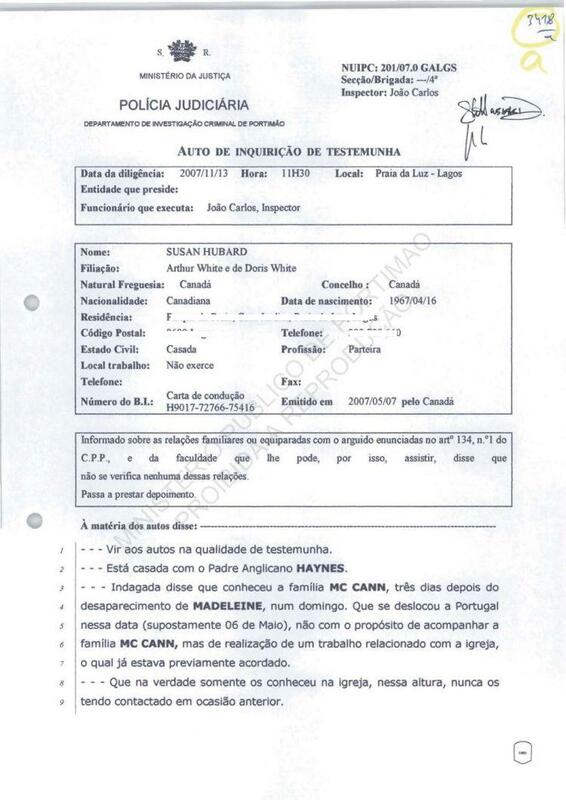 Following the McCann departure to England, she was given the key to handover to the place the McCann's rented in Praia da Luz. She handed this key over the next Monday. Her handling of the key was suggested by one of the McCann family but she does not remember who. She notes that on this Monday, she handed over the keys to the cleaning staff who forwarded the key to the responsible rental agent and whose designation she does not remember.
' 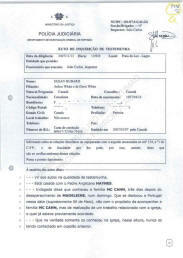 Besides these contacts, she did not maintain and other relation with the McCann family.
' Sean and Amelie, she notes, are children of normal behaviour for their age. They are active and dynamic.
' Regarding the parents, Gerald and Kate, she says that, in her opinion, they always presented a normal comportment, given the circumstances. That she noted a certain tranquillity, when in the presence of the twins. Via their gestures, she noted a great sadness and suffering. In their conversations, they would always talk of their missing daughter.
' 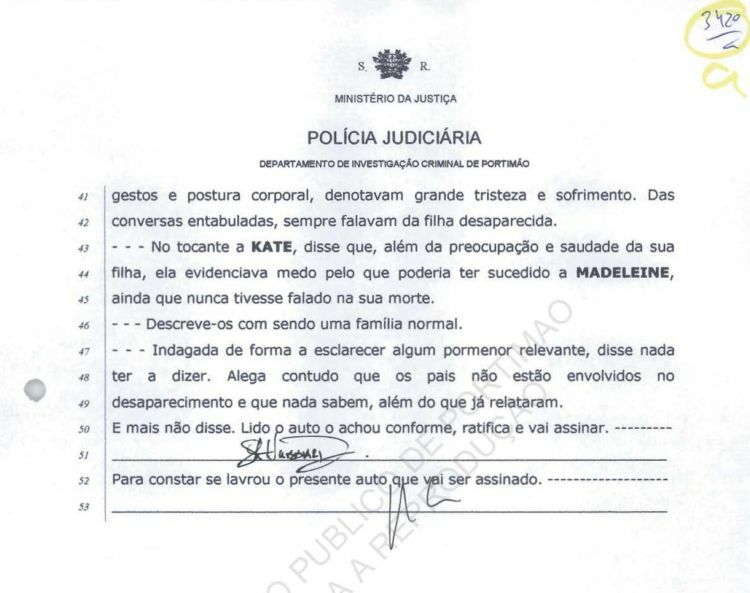 Regarding Kate, she says that, besides being preoccupied with the health of her daughter, she was scared of what could have happened to Madeleine although she never spoke of her death.
' She is not aware of any relevant details for the investigation. She claims that the parents are not involved in the disappearance and knows nothing else, other than what she has related.
' And nothing more was said. Reads and finds it in conformity, and ratifies and signs.